Happy Thanksgiving everyone! I hope you have a wonderful day with family and friends! 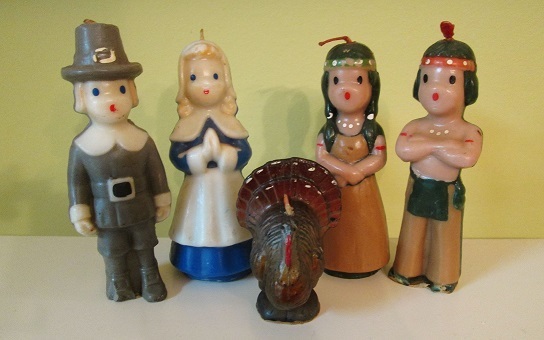 Be sure you’re a facebook fan of artgoodies and vintagegoodies! Starting tomorrow, Black Friday, I’ll be posting SALE codes on my facebook fan page! It still always feels a bit surreal to me to look down and see something I make on a page of a national magazine, and I always feel so thankful for getting continual magazine press, wow! 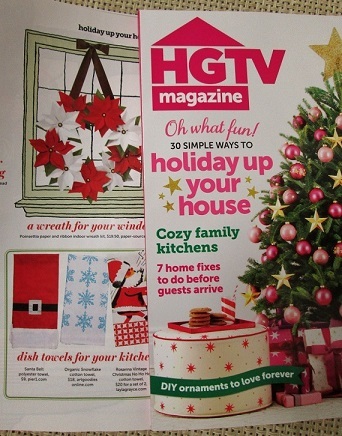 This time check out artgoodies organic all over pattern snowflake towel in HGTV Magazine! Page 103! Plus word on the street -more exciting press coming in 2014! Time for Fall! That means firing up the crock pot, wearing sweaters, drinking ridiculous amounts of hot tea, buying new snow boots, and trying to keep up during the busiest season of all. Plus don’t forget you can nab artgoodies new sketchbook leaf series towels amongst the other fall faves like quail, squirrel, deer! 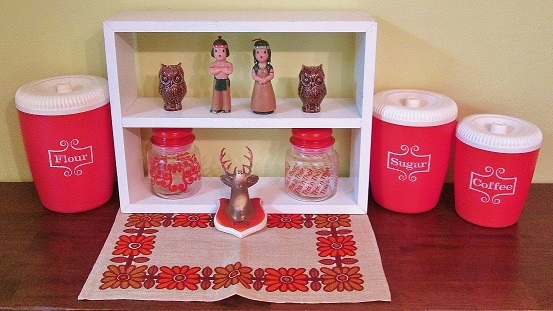 Fave vintage pieces: bright plastic canister set, mod placemat, Gurley Native American candles, owl salt and p, plaster deer head, and 2 canisters for treats! Color of the month table setting Novemeber 2013. 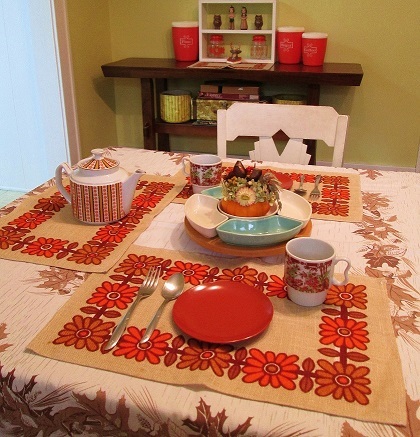 I love these bright mod vintage placemats! A couple of melmac snack plates, vintage mugs, awesome vintage tea pot, and a fantastic lazy susan! All atop a vintage leaf tablecloth. Sometimes you feel like you could use a little change. 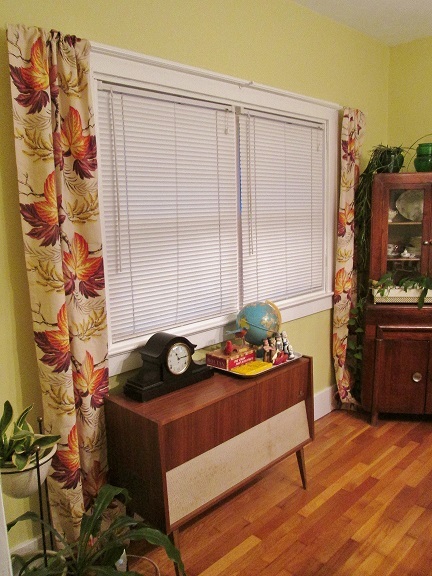 I recently acquired these gorgeous fall barkcloth draperies. A nice switch for just a month, and the house feels extra cozy for fall!